What precisely does the surgical approach associated with a cat bite entail? What is the purpose of such drainage given that the wound is being left wide open? What is a swab test? The goal of surgery in this case is to lay open the entire infected area and to reliably remove all necrotic or severely damaged tissue. This measure is geared towards depriving the infection of its primary breeding grounds. 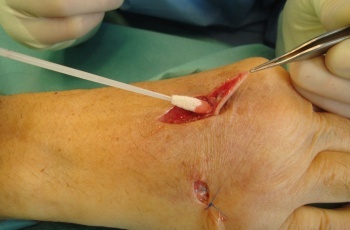 The image shows a picture taken during surgery after all necrotic and severely damaged tissue within the back of the hand had been removed. The surgery in this case took place on the second day after the patient incurred the bite injury. The infected area will be left wide open with only few strategically placed stitches securing it. Oftentimes it is necessary to provide the wound with special drainage. 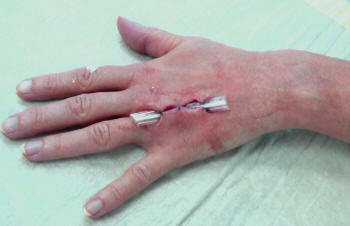 The image shows drainage applied after surgery on a beginning phlegmon on the back of the hand after an incurred cat bite. The drainage will particularly promote the deep-laying wound exudate to exit the wound. In addition, it will prevent the skin margins at the surface from closing up too early which could be conducive to the return of the infection. In case of an infection a sample of purulent wound exudate is taken for the purpose of analysis (at the latest during surgery). The extraction is achieved by immersing a cotton swab into the exudate. The exudate-covered cotton swab will then be analyzed by specialized microbiologic experts with focus on bacteria. 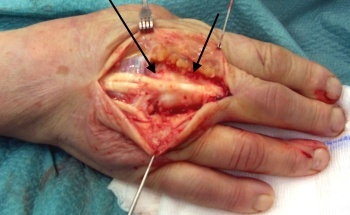 The image shows the extraction of exudate in connection with a cat bite injury to the back of the hand. The expert microbiologic examination will precisely identify the bacteria which caused the infection. Not only that, it is even possible to run tests to determine which type of antibiotic agent will be particularly efficient in fighting the detected bacteria. These tests however require a little time and usually the results will be available a few days after surgery. Until then it is common practice to administer an antibiotic which may already secure the reliable extermination of the triggering pathogen.